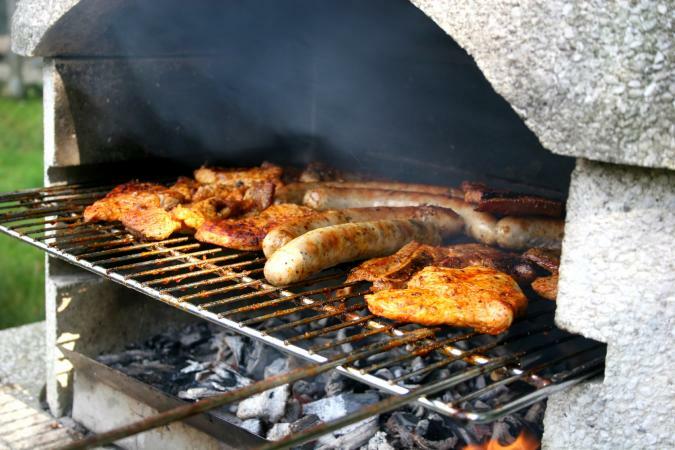 If you leave your barbecue outdoors, you may soon need to know how to clean rusty grill grates. Keeping grill grates rust-free can be a challenge due to the exposure your grill receives outdoors. Keeping your barbecue grill grates in good shape requires cleaning immediately after each use. The longer you let the burnt on food stay on the grill grates the harder it will be to clean. So you have left your barbecue out in the rain all winter and now you want to know how to clean the grates. The method you use will depend on which material they are made of. Typically barbecue grills grates are made of stainless steel or another type of metal. Most people clean their grill after each use with a stiff wire brush. This can be effective in removing the rust off of most grates, but could harm the finish of a stainless steel grill. Below are several methods of cleaning rust from grill grates. You may want to use the gentlest method first, and work your way down the list until the rust is gone. Learning how to clean rusty grill grates with a non-toxic substance is important since you will be cooking on them. Vinegar and salt are both edible substances, but will also remove rust. Mix two cups vinegar and one-cup salt in a bowl. Place your rusty grates in a large heavy-duty garbage sack. Pour the vinegar and salt into the bag and tie it shut. Lay the bag flat on the ground and let the grill soak overnight. After soaking, wipe the rust off with an old rag. The salt should act as a mild abrasive to scrape off the rust. Grill grates need to be seasoned like an iron skillet. The more you cook on them the less meat will stick, due to the fat in the meat lubricating the grate. The fat also prevents rust from forming. After each use, coat the grate with vegetable oil to lubricate and season the grate. Do not use an aerosol can of vegetable oil. Aerosol cans explode near flames. There are plenty of commercial rust removers. These generally work well, but may contain toxic chemicals you may not want near your food. Purchase a commercial rust remover specifically made for cleaning rusty grill grates in the barbecue section of your home repair warehouse store. Brush your grill grates with a soft brush to remove as much rust as you can. Put your grate on your barbecue and sprinkle it generously with baking soda. Turn your barbecue on and watch the baking soda begin to bubble and remove the rust. Turn off the grill and let it cool down. Brush the racks again with a soft brush. The fastest method of removing rust on grill grates is using a wire brush. Take the grate off your barbecue and place it flat on your concrete patio or driveway. Brush the rust off with a stiff wire brush. Flip it over and brush the rust off the other side. Stand the grate on its side and brush in between each metal rung. Wipe off the residual rust with an old rag. Wrap a piece of sandpaper around each rung of the rusty grill grate, rub the sandpaper firmly up and down. This will remove the rust effectively, but proceed with caution because it will also scratch the surface of the grate. Prevent rust from forming on your grill grates by covering your barbecue with a proper fitting cover; this will keep most of the moisture off of your grill. Clean the grates after each use; food debris left on the grill will rust in a shorter period of time than a clean grill. After you have cleaned your grates, coat the grill grates with vegetable oil. Vegetable oil repels water and keeps parts from rusting. Inspect your grill grates frequently in the winter to check for rust. Remove any small amounts of rust promptly to prevent more from forming and damaging the metal.